A pair of important Caughley porcelain plates c.1790-3, painted by Fidelle Duvivier in the Chamberlain studio, Worcester, each plate decorated in the centre with landscape/harbor scene, the panels encircled by fine foliate gilding and 'L'Amitie' border, gilded rims. Dimensions: 10" (25.5cm) diam. Condition: two tiny chips on the rim. Unmarked. 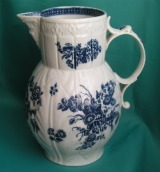 A Porcelain Cabbage Leaf Jug c.1780, mask-moulded spout and double scroll handle, transfer-printed in blue floral sprays. Dimensions: 22.5cm high. Marks: Printed "C" in blue. Excellent condition. 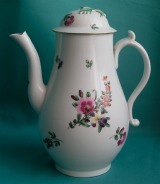 A Caughley Porcelain pear-shaped Coffee pot and cover with flower knob (missing) and high thumb-rest on the handle, painted with floral sprays in polychrome enamels, c.1780. Dimensions: 22 cm. high. Condition: some damage on the cover. Unmarked. Caughley Porcelain part coffee/tea, set, vertically fluted shape with sharply kicked handle, comprising 4 coffee cups a teabowl and 5 saucers, painted in cobalt blue and gilt c.1790. Dimensions: cup 6.5 cm high x 6.5 cm diam, teabowl 5.5 cm x9 cm diam, saucer 14 cm diam. Excellent condition. Unmarked. A Caughley Porcelain Part Dessert Set c.1780-90, comprising 4 dessert plates, 1 heart-shaped and 2 square dishes. decorated with painted flowers in underglaze blue and gilt. Dimensions: plates 20.5 cm diam, square dish 23 cm x 23 cm, heart-shaped dish 27 cm x 18 cm. Marks : Impressed "Salopian", "X" painted in gold. Condition: Some ware on the gilding. Caughley Porcelain Teapot and Sucrier c.1785, the teapot and cover of fluted globular shape with foliate-moulded high loop handle copied from Chinese Export prototypes, the sucrier and cover of similar shape, both printed in underglaze blue with the "Pagoda" or "Two Temples" Pattern. Marks: Printed "S x" on the base. Condition: the covers with a chip inside the rim, some ware on the gilding. A Caughley Porcelain coffee set, printed in underglaze blue with the "Pagoda" or "Two Temples" design, comprising six coffee cups and six saucer dishes. Dimensions: cup 6 cm diam x 6 cm high, saucer 13 cm diam. Printed "S" marks on the base. Fine condition. A Porcelain Coffee Cup, a tea-bowl and 2 Saucers, soap rock body, royal flute shape, decorated with a continuous gilt foliate band, the handle with flattened thumb rest (copied from the Chinese) c.1785-90. Dimensions: coffee cup 6cm high, tea bowl 8,5cm high x 6cm diam, saucers 13cm and 14cm diam. Unmarked. Condition: manufacturing fault on the handle of the coffee cup and the tea-bowl saucer, slight ware on the gilding. Printed or painted "C" marks c.1775-95, sometimes mistaken for the Worcester crescent mark. Blue Printed or painted marks c.1775-95.